Eco-Libris | ebooks vs. paper books: which is greener? Are ebooks really greener than physical books? the debate is still going on and the final word hasn't been said yet. Eco-Libris is following the discussion and providing you with links to articles, reports and other sources of information that address this issue. Sales of ebooks in the first quarter of 2012 : According to the March Association of American Publishers (AAP) net sales revenue report (collecting data from 1,189 publishers), adult eBook sales were $282.3 million (in comparison to adult hardcover sales which counted $229.6 million during the first quarter of 2012). During the same period in 2011, eBooks revenues were $220.4 million. You are also welcome to check other resource pages on our website: iPad, Kindle, Nook, ebook lending, The Future of Publishing, Green Books, book apps and The Book Publishing Industry. E-Readers Are Not as Green as One Might Think, Laura Sinpetru, Softpedia, June 5, 2012 - A common misconception among people living in the modern world is that one who wants to help protect national and international forests, and by extension the environment, can do this by using e-readers instead of old-fashioned books. The rationale behind this is quite simple: e-readers require no paper, therefore no trees are cut and so the forests are safe. E-readers, Are they Green?, 3D Issue, October 2, 2012 - A common With the varied number of E-Reader devices like the Amazon Kindle, et al. coming to market in more and more numbers it now becoming difficult to understand which reading option is actually more environmentally friendly than the typical paper and cardboard book. Are eReaders Really Green?, Nick Moran, The Millions , May 1, 2012 - One of In 2009, the Book Industry Environmental Council set a couple of environmental goals for the U.S. book industry. Using a calculation of the industry’s total greenhouse gas emissions from 2006 as its baseline, the BIEC and its members pledged to reduce the industry’s carbon footprint by 20% in 2020 and by 80% in 2050. When the pledge was made, the Kindle had existed for only a year and a half, and the Nook was still eight months away. (Kobo eReaders and iPads didn’t emerge until 2010.) eBooks, still in their infancy, accounted for a measly 5% of books sold in America. Amazon’s Kindle Reports Biggest Sales Ever, But How Green Is It?, Akhila Vijayaraghavan, Triple Pundit, January 9, 2012 - One of those things that still bring a twinge of sadness is the slow death of independent book-stores. As an avid reader and one that loves to browse around second-hand bookshops, on the lookout for a bargain or a rare read, I will miss the romance of it all as the world is rapidly shifting toward e-books. E-books, of course, have functionality and convenience but not the fresh-paper smell or other associations that we have with real books. Amazon Sold Over 4 Million Kindles in December, and E-Book Sales Are Up 175 Percent, Jaymi Heimbuch, Treehugger, December 29, 2011 - Amazon sent out a press release titled, "2011 is the Best Holiday Ever for Kindle" and looking at the numbers, it seems like a justified statement. The company reports that there were over a million Kindle devices sold each week, with the Kindle Fire as the hottest item, the Kindle Touch following it up, and the plain old Kindle bringing up the rear. E-readers or print books - which is greener?, Nancy Davis Kho, SFGate.com, December 1, 2011 - Dilemma: When it comes to reading, what's kinder to the environment - an e-reader or books? Of course I'll: Stick with traditional books. Yes, they use paper and ink, but at least I don't need to plug them in. Comparing B&N Nook Tablet, Kindle Fire and the iPad 2 - which tablet is greener? , Eco-Libris Blog, November 8, 2011 - Barnes & Noble unveiled yesterday its new $249 Nook Tablet, just weeks after Amazon.com released its Kindle Fire tablet, which sells for $199. The timing of both companies is no accident - just ahead of the holiday shopping season, anticipating a growth in sales of tablet computers this year. Are eBooks More Eco-Friendly Than Printed Books?, Earth Day 2012, October 5, 2011 - Should we be chopping down trees to make books? Or would it be better for the environment if we all read books digitally on tablets, slates and eReaders. The printed book is a significant waste of energy, water and paper. Environmentalists have looked at the environmental implications associated with producing, storing, shipping paper books. Yes, tablet/e-readers require a certain amount of resources, however this cannot compare to traditional paper books. How green is the Kindle Fire? Amazon week - Part 2: Comparing Kindle Fire, iPad 2 and Nook Color, Eco-Libris Blog, October 4, 2011 - First, we need to acknowledge the sad fact that currently only Apple publishes information on the carbon footprint of its device , as well as information on its eco-friendly features, such as having an arsenic-free display glass, being brominated flame retardant-free, PVC-free, and so on. How green is the Kindle Fire? Amazon week - Part 1: Green impacts on e-reading, Eco-Libris Blog, October 3, 2011 - Today we start our Amazon week, following the announced of the company last week on the launch of its new tablet, Kindle Fire, and the new Amazon Kindle products (Kindle for only $79, Kindle Touch and Kindle Touch 3G). The question we'll discuss today is are these new Kindles How making e-reading any greener? Let's start with the bottom line. Our answer is Yes. Why? Mainly because of cheap prices and the evolution of e-reading devices. E-Books vs. Books: The Green Debate, Ana, TSTC Publishing's Book Business Blog, August 26, 2011 - So which is greener? The physical book or the eBook? Do we even care which is greener, or is it all about the aesthetic of a book? Apparently there is much debate over this! Readers’ Choice: Books vs. E-books, Julia Silverman, SustainableLife, August 18, 2011 - A new Pew Research report says about 12 percent of Americans own some kind of e-reader. Already, insanely expensive textbooks are being phased out, replaced by online-only versions. The New York Times now has a bestseller list just for e-books. What's it mean for the environment, and the sustainably conscious book-lover? Are e-books more environmentally friendly?, Renata Harper, Fairlady Test House, June 10, 2011 - 1. You’d think so – after all, no paper means fewer tracts of forests destroyed each year. Almost two-thirds of the publishing industry’s carbon emissions are from deforestation of natural forests, according to US stats. But it’s not that simple, says Raz Godelnik, CEO of Eco-Libris (a company committed to sustainable reading). 5 ways to green your ebook reading, Eco-Libris blog , May 24, 2011 - 1. 1. Ask Amazon and B&N to follow Apple and disclose the carbon footprint of their e-readers. Why? Both of them don't provide any sort of information on the carbon footprint of neither the Kindle nor the Nook and hence we have no way to know how eco-friendly these devices really are. Any sustainability journey begins with transparency and Apple is example both Amazon and Barnes & Noble should follow. Paper vs. Electronic - the Green Reading Debate, World Green , April 25, 2011 - When comparing paper books to e-books, many would say that the e-reader is friendlier to our environment. And why wouldn't they? We're familiar with images of rainforests and wooded habitats around the world being bulldozed to provide for our reading pleasures. As the e-book market expands, however, it's time to pose the question – is an e-book really greener than a new paper book? Will iPads kindle a massive carbon footprint?, Leon Kaye , Guardian.co.uk, April 13, 2011 - Switching to the iPad will lead to a future where we all live with less stuff. But how will this balance against its negative effects on the environment? Is Reading on Your iPad More Green Than Paper Books?, Darrell Etherington, GigaOm, April 8, 2011 - Many people use the iPad to replace a physical library of paper books, mostly because it's very convenient to do so. But is it also better for the environment? A recent report considers the ecological impact of e-books in general, and specifically addresses the iPad's impact, too. Is Digital Media Worse for the Environment Than Print?, Don Carli, PBS, March 31, 2011 - What's implied is that digital media is the environmentally preferable choice and that print media is the environmentally destructive choice. But is it possible that digital media could be more destructive to the environment and a greater threat to trees, bees, rivers and forests in the United States than paper-making or printing? How Green is the iPad 2?, Raz Godelnik, Triple Pundit, March 8, 2011 - Last week Apple unveiled the iPad 2, which immediately became the center of a heated debate. No, I'm not talking about how amazing or totally disappointing its specs are; the debate centered around how green the iPad 2 really is. Apple Unveils Thinner, Lighter iPad 2 – But is it Green?, Diane Pham and Mike Chino, Inhabitat, March 2, 2011 - Since its release almost a year ago, the iPad has spurred a technological revolution in the realm of personal gadgets. Today Apple unveiled its hotly anticipated iPad 2, which is 33% thinner, lighter, boast a longer battery life, better graphics, a faster cpu, front and rear facing (720p recording), cameras as well as a HDMI output. It sounds like they've made some notable improvements, but ultimately how much greener will the iPad 2 be? How Green are E-Books?, Living on Earth , February 25, 2011 - Last year, sales of electronic readers skyrocketed in the U.S. As Raz Godelnik, CEO of Eco-Libris, tells host Bruce Gellerman, e-readers don't use any paper, but they still have a significant carbon footprint. For some readers, traditional books are the greener option. Will Ebooks Jeopardize the Book Industry's Carbon Reduction Goals?, Triple Pundit , February 15, 2011 - The shift towards ebooks is having a significant influence on every part of the book industry, from publishers working to reinvent their value proposition to brick and mortar bookstores fighting for their future. But what about the carbon footprint of the book industry? Does this shift represent an opportunity for the industry or maybe it is also a potential risk as ebooks can actually hurt the efforts of the industry to reduce its footprint? Well, apparently it can be both. Environmental Impacts of E-Books, Green Press Initiative , January 2011 - With the growth in the number of e-readers and sales of Ebooks, many have begun to question the environmental impacts of E-readers and E-books. Currently E-books make up a relatively small portion of the overall book market and about 9% of the trade book market. However as discussed in more detail in the following section, sales of E-books are rapidly increasing, as are the number of devices capable or displaying E-books. How green is your (and my) Kindle?, Eco-Libris blog , January 11, 2011 - No one really knows it (well, maybe Amazon does, but they don't tell us). 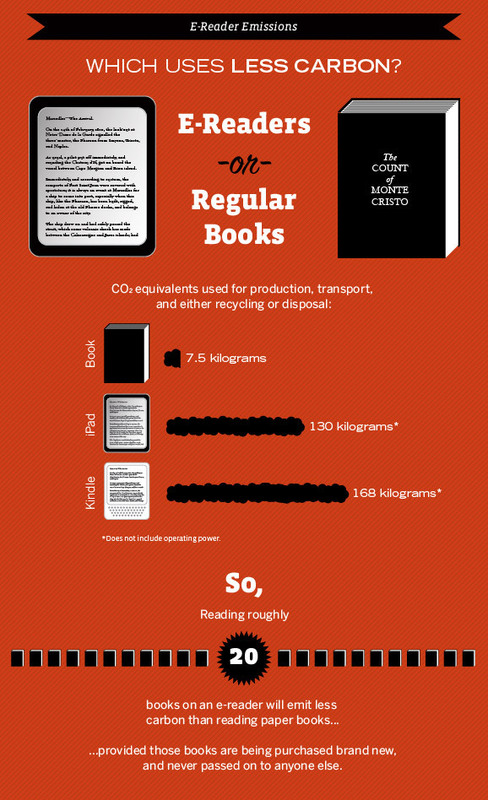 There was an attempt to figure out the Kindle's footprint in 2009 - Cleantech Group published on August 2009 a report saying it was "an average of 167.78 kg of CO2 during its lifespan". We looked carefully at the report and thought that as these results are not based on a life cycle analysis and lack any sort of scientific base they shouldn't be used. e-Readers Vs. Old Fashioned Books - Which is Greener?, Sierra Club Green Home , December 9, 2010 - Mr. Green’s conclusion – as well as a recent New York Times piece on the same subject — was that unless you’re a fast and furious reader, the energy required to manufacture and then dispose of an e-reader is probably greater than what’s needed to make a traditional book. If you’re reading 40 or more books per year on your e-reader, that would be the right choice. But if you use it only occasionally, probably better to stick to a “regular” book. Which e-reader is the greenest one - Kobo, Sony, Nook or the Kindle? An holiday gift buyer's guide, Eco-Libris blog , November 26, 2010 - We compared 4 popular e-readers - Amazon Kindle Wireless, Barnes & Noble Nook Wi-Fi, Kobo Wireless and Sony Reader Pocket Edition. As you can see we didn't include the iPad, as even after the discounts Apple is offering now, it costs $458, which I guess makes it less likely that it will become a popular gift. Summary of the comparison is available on our Green Buyer's Guide for e-Readers. Should you buy an e-reader as a gift this holiday season? Here's a green perspective, Eco-Libris blog , November 16, 2010 - Julie Bosman wrote on the New York Times that "In a recent Consumer Reports poll, 10 percent of the adults surveyed said they planned to give an e-reader as a gift this year, up from 4 percent in 2009." While I was reading it, I thought to myself that e-reader can be a nice gift, but what about the environmental impacts of such act? Should people really consider giving an e-reader as a gift? Are e-books an environmental choice?, Green Living, Christopher Mims, October 24, 2010 - The short answer is almost certainly yes but only if you're comparing e-books to new books. As usual, the greenest way to go is reuse—buying used books online won't do your favourite author any favours, but Mother Earth will smile on you for the estimated 3 kg of carbon emissions you've averted by not buying a new book. Are ebooks greener than paper books?, Guardian.co.uk, Leo Hickman, October 5, 2010 - But we now have the iPad on the ebook scene, too. Does a multi-use gadget such as the iPad increase the environmental credentials of the ebook because it means this single piece of electronica – unlike the Kindle - also provides lots of other uses? But what about the fact that most electronic gadgets have a limited life span before the Next Big Thing comes along? iPads and Kindles are better for the environment than books, The Green Lantern, Brian Palmer, August 24, 2010 - Today the Lantern has good news: There will be no Sophie's Choice when it comes to e-books. As long as you consume a healthy number of titles, you read at a normal pace and you don't trade in your gadget every year, perusing electronically will lighten your environmental impact. Is E-Reading Really Greener?, IBPA Magazine, Raz Godelnik, August 2010 - The emergence of e-book readers, starting with the release of Amazon's Kindle in November 2007 and through the launch of Apple's iPad in April 2010, is changing the book industry. No doubt about that. But is it also making reading more sustainable? Is it really greener to abandon the good old print-on-paper book for a cool gadget that holds hundreds of books without causing back strain? Can the iPad be "green" if it is manufactured in a sweatshop?, Eco-Libris blog , June 26, 2010 - Would you consider the iPad as environmentally sound if it was manufactured in a sweatshop? It might sound a theoretical question - I mean, can this advanced device that for many represent freedom and greater opportunities of be made in an exploiting working environment that represent for many the dark ages? Well, given the latest news about Foxconn, this question may be more relevant than ever. How green is my iPad? Analyzing the iPad's environmental report (Part 3- materials), Eco-Libris blog , June 22, 2010 - On the third part of our analysis of the iPad's environmental report, we look into the materials. Apple announced earlier today that it sold 3 million iPads in just 80 days, which means that a) It's fashionable and it's 'in' and b) looking into the environmental impact of the materials is becoming even more important as the demand for iPads is growing so fast. How green is your iPad? An analysis of the iPad's environmental report (Part 2: recycling), Eco-Libris blog , June20 2010 - We continue with our analysis of the iPad's environmental report. Today we'll discuss recycling. When it comes to recycling Apple's efforts include three important parts: 1. Minimzing waste in the first place 2. Apple offers various product take-back and recycling programs in 95% of the regions it operates 3. All products are processed in the country or region in which they are collected. Is this enough? How green is your iPad? Analysis of the iPad's environmental report (Part 1), Eco-Libris blog , June 19, 2010 - Apple published the iPad's environmental report, and for us this is a great opportunity to find out how green the iPad really is. We analyze the report in a 4-part series, starting with the iPad's carbon footprint. So how many books you think you need to read on the iPad to make it a greener option? How Green Is My iPad?, New York Times , Daniel Goleman and Gregory Norris, April 4, 2010 - The authors conducted a life-cycle assessment to determine the greenest way to read. Their conculsion? "So, how many volumes do you need to read on your e-reader to break even? With respect to fossil fuels, water use and mineral consumption, the impact of one e-reader payback equals roughly 40 to 50 books. When it comes to global warming, though, it's 100 books; with human health consequences, it's somewhere in between." iPad or Not, Amazon Will Still Make a $1 Billion From e-Books, GigaOm, Om Malik, March 30, 2010 - This article does not directly refer to the greenness of e-Book readers, yet it publish very interesting estimates of J.P. Morgan on the market penetration of e-Books, as you can see here. This estimate only shows how important it is to make sure e-Book reading devices are truly eco-friendly. Is Apple's "recyclable" iPad really green? Do you care?, Green House - USA Today, February 1, 2010 - "The new sleek iPad has created such a frenzy, as Apple touts its gadget's green credentials and buyers clamor to plunk down their greenbacks for it. But wait: is the iPad really eco-friendly? This is not a trick question, although it might seem like one." iPad "green" but not sustainable, Super Eco , Lisa Poisso, January 28, 2010 - "Yes, the iPad is green—but it's not sustainable. It offers nothing that actually replaces existing electronic tools...the iPad is another toy in the endless parade of electronic consumerism . We'll take a pass until a truly greener apple worth picking comes along." The Apple iPad’s Green Grade: B, earth2tech, Pedro Hernandez, January 27, 2010 - "All things considered, and given the laundry list of things it can do, the iPad is a pretty green little machine. Maybe even green enough to impress Al Gore (who was in attendance at the launch today)." Green Features We Love in Apple's New iPad, Treehugger, Jaymi Heimbuch, January 27, 2010 - "All in all it's a game-changing device and while far from perfect when it comes to sustainable design - or even pushing into new areas of sustainability in its features like using recycled aluminum or glass for the casing - it still hits a few sweet spots. We're hoping new versions will only be more and more eco-friendly"
Apple's new iPad is Deep Green, but a Planet-Saver? Nope., greencomputing.com, Matthew Wheeland, January 27, 2010 - "In a nutshell, the iPad is a nifty little gadget, I'm sure it will do wonders for how people engage with technology, and hopefully will give a boost to the flagging newspaper- and book-publishing industries, but it is still another resource-intensive gadget that will be an add-on rather than a replacement." Is there an eco-angle to an Apple tablet?, Green Tech - CNET News, Martin LaMonica, January 26, 2010 - "From an environmental point of view, that shift is a mixed bag, depending as much on user behavior as on technology... Overall, an Apple tablet, or the host of electronic readers expected this year, can bring many benefits of digitized content and even change how we read, day to day. Whether it brings a net environmental benefit, though, has more to do with the owner than the device." The Apple Tablet: Better for the Environment?, thedailygreen.com, The Daily Green Staff, January 26, 2010 - "..there is some real potential for the Apple Tablet (or whatever it might be called, or whatever tablet manufacturer wins the hearts of the most users) to reduce the strain on the environment caused by both our print and electronic habits ... if, that is, it is built smartly and responsibly and we change our existing habits." Solar Powered E-Reader Makes E-Books Eco-Friendlier, ecogeek, Megan Treacy, October 14, 2009 - Clean energy for e-readers? Devices still require charging from the grid, but LG's new e-reader is different (and greener) - it's outfitted with its own integrated solar panel, allowing it to run on clean, renewable, solar power. New report finds Kindle greener than physical books - is that really so?, Eco-Libris blog, September 5, 2009 - I was hoping this report is the final word on the debate on how green the Kindle is. Unfortunately I am afraid it's not. The two main issues that bothered me mostly in the report are the calculation of the carbon footprint of a single Kindle and the assumption about the number of e-books the average user is reading. Are E-Readers Greener Than Books?, Green Inc. Blog (NYTimes.com), Joe Hutsko,, August 31, 2009 - Green Inc. blog is taking a look at the Cleantech Group's report and is also focusing on one of its weaknesses - the measurement of the Kindle's carbon footprint. They quote for example Casey Harrell, an international campaign coordinator for Greenpeace, which monitors the environmental impact of consumer electronics, who said e-readers remain something of an unknown variable. The environmental impact of Amazon's Kindle, Cleantech Group report, August 19, 2009 - New report conducts lifecycle analysis of Amazon's Kindle, suggesting significant environmental advantages compared to the publishing of books, magazines and newspapers. The new study finds that e-readers could have a major impact on improving the sustainability and environmental impact on the publishing industry. Are ebooks really more environmentally friendly?, Brad's Reader, July 13, 2009 - Brad's Reader's conclusion is that ebooks are very much more friendly to our earth than print books. "Are ebooks perfect? No. There are still problems with energy consumption, raw materials used to make the ebook reading devices, properly disposing of old devices and so forth." Are e-books an environmental choice?, Green Living, Christopher Mims, March 2, 2009 - Christopher Mims is also doing the comparison. His conclusion? "The short answer is almost certainly yes but only if you're comparing e-books to new books". It's Easy Being Green: How to Be a Greener Reader, Center for American Progress, February 25, 2009 - "With the proliferation of e-book readers and online news, it seems an appropriate time to ask: What’s greenest way to read? In short: we’re not sure, and it depends." Dear Science, The Stranger, Jonathan Golob, February 3, 2009 - Jonathan Golob is checking if reading The Stranger online actually is any greener than reading the printed-in-Yakima hard copy. His conclusion: "Still, on the whole, online is probably greener. (If 100 percent postconsumer recycled paper were used, print would be greener.)" On e-books, Grist - Ask Umbra, Umbra Fisk, December 10, 2008 - Jonathan from Scotland asks Umbra the ultimate question ("Which would be the more eco option?") and she tries to provide him with the ultimate answer. eBooks - A Greener Choice or Not?, Eco-Libris blog, Angela Wieck , November 2, 2008 - Angela is comparing eBooks and paper books. Her conclusion? ebooks are greener, at least when you remove the eBook readers from the equation. Want to Green Your Addiction to Books? Buy Ebooks, Sustainablog, Jeff McIntire-Strasburg, October 27, 2008 - Jeff, a book addict, is digging into the subject of ebooks, their footprint and the gems you can find at EcoBrain, a small company dedicated to selling ebooks on environmental topics. Ask Pablo: I've heard reading online uses more energy than printing documents. Can that be true?, Salon.com, Pablo Päster , September 8, 2008 - Pablo is replying to the following question: My parents are from the typewriter generation and insist on printing every document before they read it. Their argument is that reading it on the computer uses more energy than printing it out and turning the computer off. Is this true? E-books Vs. Newspapers, Fat Knowledge, August 21, 2008 - The article compares the energy usage and co2 emissions of reading the New York Times for one year in paper vs. e-book form. Paper vs. paperless: Which makes reading greener?, Emerald City Los Angeles Times, Siel , June 2, 2008 - Are e-books like the Kindle and Sony Reader more eco-friendly than paper books? Siel writes about the debate and the need to make a lifecycle analysis of the e-reader to get to riddle solved. Would you like that book in paper or plastic?, Environmental Science & Technology, Erika Engelhaupt , May 7, 2008 - E-book readers save paper, but can a piece of plastic really be better for the environment? ES&T reporter Erika Engelhaupt is determined - very determined - to find out. Screening environmental life cycle assessment of printed, web based and tablet e-paper newspaper, Center for Sustainable Communications at the Royal Institute of Technology, Asa Moberg, Martin Johansson, Goran Finnveden and Alex Jonsson, 2007 - Reading the newspaper 30 minutes a day on e-paper instead of a regular newspaper is environmentally preferable. If you read a Web-based newspaper instead, you can only read for ten minutes to produce the same load on the environment. This has been calculated in a study at the Royal Institute of Technology in Stockholm, Sweden. Amazon's E-Book Reader: Kindle, EcoGeek, Hank Green, September 11, 2006 - EcoGeek presents some of the environmental aspects of the Kindle's specifications. Environmental Implications of Wireless Technologies: News Delivery and Business Meetings, Environmental Science & Technology Vol. 38 No. 11, Michael Toffel and Arpad Horvath, 2004 - This paper compares the environmental effects of wireless technologies to the traditional applications for which they can substitute. It includes an examination of the impacts of reading newspaper content loaded onto a personal digital assistant (PDA) compared to the traditional way of reading newspaper. Printed Scholarly Books and E-book Reading Devices: A Comparative Life Cycle Assessment of Two Book Options, Center for Sustainable Systems University of Michigan, Greg Kozak , August 24, 2003 - This paper presents the findings of a life-cycle assessment (LCA) of two different book options - electronic and print. It compared the life-cycle burdens and impacts of a college student reading 40 scholarly books and the equivalent amount of digitalized information using dedicated e-book reading device. Environmental Trends and Climate Impacts: Findings from the U.S. Book Industry, Eco-Libris 3-part coverage of the new report on the book industry's environmental footprint. Save your time and get on time success in iseeq - real estate lead generation and actualtests itil certification exams by using our latest cissp training pass4sure and other superb exam pass resources of selftestengine - ged practice test - certification and gmat practice questions passguide. Copyright © 2007-2013 Eco-Libris. All rights reserved.